Castleford Tigers Women go into a huddle before their game against Bradford Bulls. Castleford Tigers Women’s game against defending champions Bradford Bulls was billed as a potential classic and it certainly lived up to that accolade as the Tigresses picked up a historic 40-16 victory. 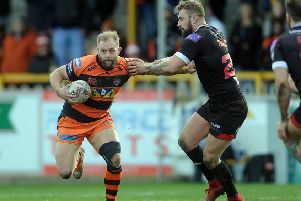 This was the first time in the club’s history that Castleford have beaten their West Yorkshire rivals after losing all three previous clashes last season. The home side had unfinished business and started the game at a furious pace. A line break from Tara Stanley allowed Lacey Owen to cross the whitewash and send the crowd in raptures. Six minutes later another opportunity arose as Tamzin Renouf broke the line and released Grace Field who scored her third try of the season. Moments later, Stanley crossed the try line herself as Castleford led 18-0 in the opening quarter of an hour. Bradford slowly but surely began to find their feet and they found the try line through Heather Macdonald. Their celebrations were shortlived, though, as the Tigers produced a fine response. Yet another line break allowed Kelsey Gentles to power over and increase the lead to 20 points. Despite that healthy lead, the Bulls did threaten a comeback when Jess Courtman scored in the opening minutes of the second half. Claire Garner’s first conversion cut Castleford’s lead to 14 points as the intensity of the game increased by several degrees. The Tigers hit back and Renouf fought her way past the Bradford defence to touch down. Stanley’s conversion made it a 20-point lead. Four minutes later, Georgie Hetherington got among the tries as her unconverted effort put the home side within inches of the victory. However, the moment of the match came with 20 minutes remaining as Olivia Grace took out half of the Bulls defence with a clever dummy and crossed the try line to the delight of the home crowd. A late effort from Chrissi Nettleton closed the gap to 40-16, but there was simply no stopping the Tigresses. Next up for the Castleford Women is a home clash with Wigan Warriors who have also enjoyed a good start to the season. Cas are currently second in the Super League table, only two points behind St Helens, who have played one game more than the Tigers.